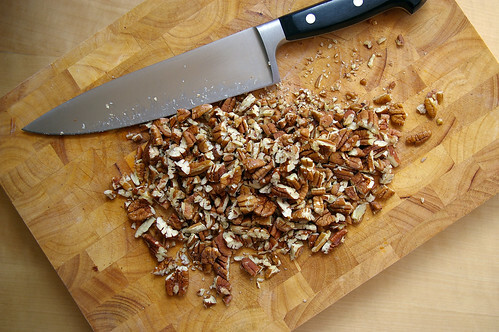 The first time I had pecan pie was when I was 16 and visiting a friend in England for a month during summer holidays. There were visits to Stonehenge and London, trips on the train to Bath, but a lot of the time was spent hanging out in Bristol with her boyfriend and his friend, with whom I struck up a short summer romance. It was not to last, but part of our brief courtship included an invitation to dinner at his family’s house. Details have likely been repressed due to all that teenage awkwardness, but one thing is clear in my mind: his mom made pecan pie. But I can rarely get excited about making pastry. 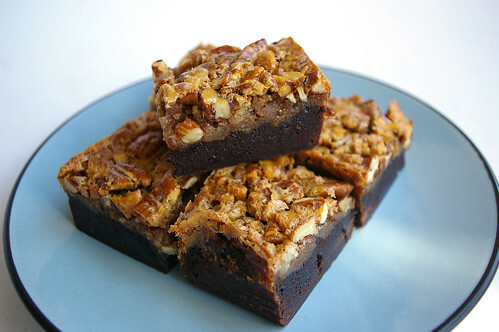 And then I came across a recipe for Bourbon Pecan Pie Brownies. 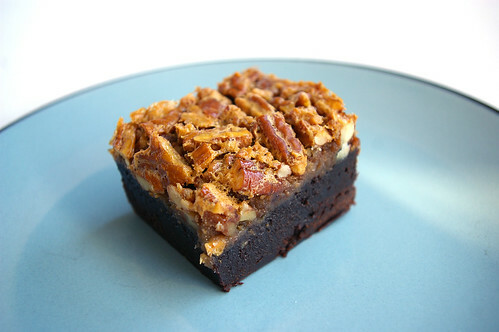 Where a crust would be, instead a fudgy, chewy brownie and a pecan pie topping kicked up with some bourbon. Seemed to me like two very fine things coming together to make an even finer thing. I found it on a blog, but the recipe originated (and had been adapted from) an NBC Sunday Night Football Cookbook, the idea of which totally charms me. 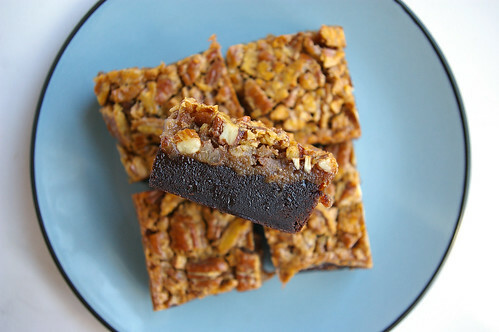 I used to use the same brownie recipe every time I felt like a chocolate fix, until I found a recipe for Rocky Road Brownies, which used no leavening. The resulting brownies were dense and fudgy and a revelation. They are, unsurprisingly, rich — two sweet desserts combined into one. And the bourbon retains some of heady kick, so be warned. The original recipe says it makes 16 bars; I’d suggest cutting smaller. After all, you can always eat two. The original recipe calls for the two layers to bake in the oven for 30 to 35 minutes to set the pecan pie layer. Don’t be afraid to go longer; mine were in for 45 minutes before the centre had set. Preheat oven to 325F (160C). In a small bowl, beat together eggs and vanilla, then set aside. 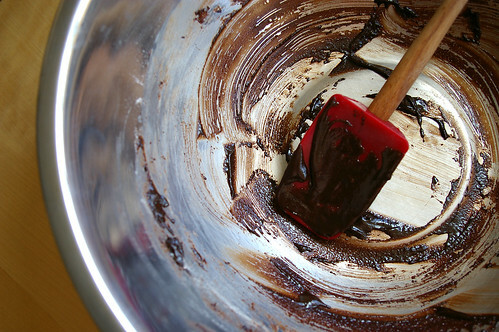 In a double boiler set over boiling water, combine butter, cocoa, sugar and salt. Mix as the butter melts until everything is combined. Remove from heat and whisk in egg and vanilla mixture. Add flour and stir until combined. 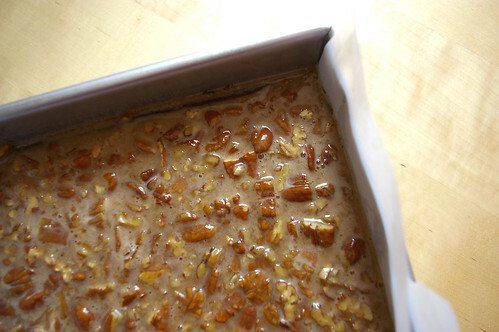 Pour into 8 by 8-inch (20 by 20 cm) baking dish. Bake for 20 to 25 minutes. Let cool completely. Beat together corn syrup and sugar until smooth. Add eggs, vanilla and cinnamon, and beat. Add butter and bourbon and beat again until thoroughly combined. 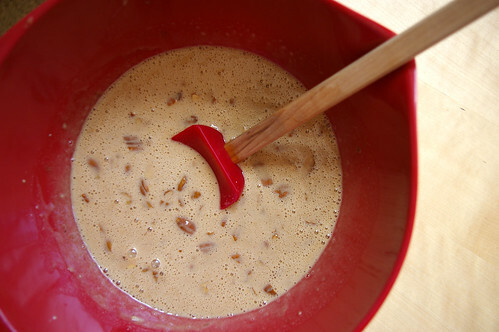 Stir in pecans and pour the mixture over the brownie layer. Bake for 30 to 35 minutes. Let cool completely, then refrigerate for at least two hours before serving. This article first appeared in the Calgary Herald. For more food-related articles and recipes, check out the Herald’s food page. These look positively divine. I can’t wait to make them! Wow… little wedges packed with goodness! 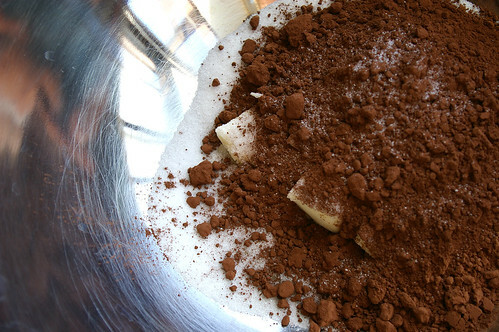 Great idea to skip the pastry, this would added a much more interesting flavor! Bourbon, yum! I’ve been craving a super rich dessert lately (probably because my sister is in Montreal texting me pictures of the desserts at Juliet et Chocolate) and this looks like it fits the bill. aahhh want! Its funny that your first taste of pecan pie was in England – its a 100% North American dish, since the two primary ingredients (pecans and corn syrup) are both native to North America. These look delicious though. Can’t wait to try them. I did wonder if they made it because it would, they thought, be something I was used to?